Last date for offline payment of fee through Indian Bank: 25.03.2019. Candidate shall possess the following qualification on the date of this notification viz. 01.03.2019. 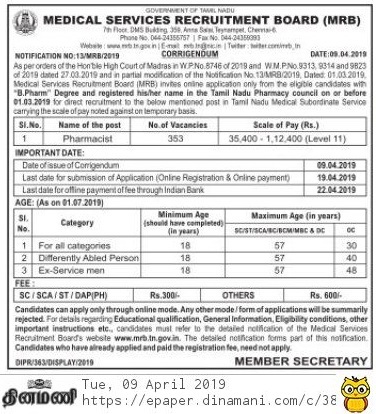 Selection will be made based on the marks scored by the candidates in their academic and technical qualification(s) for the post of Pharmacist duly following the rules of reservation and communal rotation issued by the Government of Tamil Nadu. There will be no oral test (Interview) for the post.